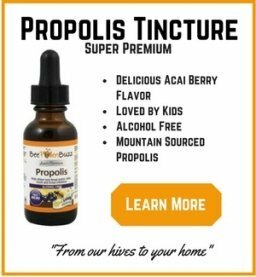 Scientists from around the world have begun to figure out what those of us in the bee industry have known for years - that Bee Propolis is one incredible substance with seemingly unlimited benefits to human health. And now they are beginning to investigate the many Bee Propolis health benefits through proper research studies. These studies are revealing incredible health benefits for conditions ranging from allergies to cancer protection to even shielding us from the radiation of cellular phones! It seems like the number of bee propolis health benefits are unlimited, that it has positive activity in almost all areas of the body. These studies are just a small sample of the research going on around the world on this amazing compound. I hope to have more to report to you soon! Propolis has a good reputation for having beneficial effects in asthma patients. But the mechanism was not clearly understood so scientists looked at the effect of a compound called CAPE (caffeic acid phenethyl ester). CAPE is the most extensively studied component in propolis and has shown tremendous results in many other studies for conditions ranging from inflammation to athletic performance. 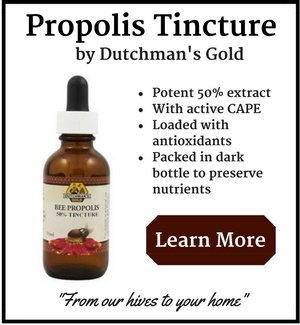 The scientists concluded that propolis (more specifically the CAPE in propolis) inhibited the inflammatory and immune response that asthmatics often experience. They went on to say that "this study provided a new insight into the mechanism of CAPE in immune response and the rationale for propolis in the treatment of asthma and other allergic disorders." 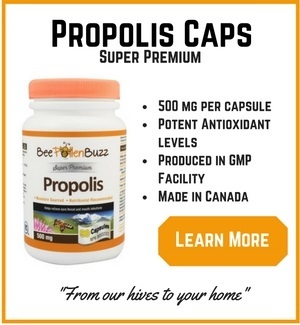 I just recently began using propolis with a long term allergy and asthma sufferer. Results have been very promising so far. Their occurrence of chest colds has decreased to zero so far. I'm having him continue with the propolis through the summer so it will be interesting to see how his allergies improve. The aim of this study was to assess whether one of the many bee propolis health benefits is a radio protective effect in mice exposed to a single radiation dose. The mice were treated with quercetin or propolis each day for three consecutive days either before or after being exposed to gamma-irradiation. The scientists found that the mice that received the propolis before being exposed were less sensitive to irradiation than those given the propolis or quercetin after being exposed. So it is a good idea to take your bee propolis each morning before you begin using your cell phone or microwave. We are all exposed to radiation on a daily basis now due to the countless cell phone and satellite signals that surround us. 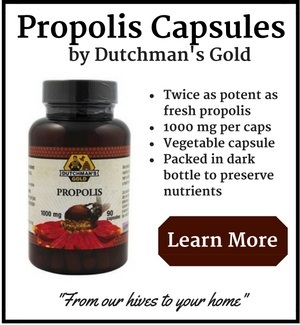 I take propolis on a daily basis in order to help protect me from this excess radiation. I also take an extra dose leading up to any flying I may be doing as radiation levels are quite high in commercial planes. In the August 2009 issue of the Oncology Report, a group of scientist's looked into the growth inhibitory activity of ethanol extracts of Propolis in human colon cancer cell lines. More than 300 bio-active compounds have been identified from bee propolis in various regions of the world. The objective of this study was to examine whether the ethanol extracts of Chinese and Brazilian propolis may exert anticancer activities in four human colon cancer cell lines. In three of the four cell lines, the extracts of both Chinese and Brazilian propolis caused a marked dose-dependent growth inhibition on the cancer cells. The report concluded that their findings indicate that the ethanol extracts of propolis contain components that may have anticancer activity. Ultimately, one of the many bee propolis health benefits may be as a colon cancer preventative and treatment. But propolis' effect don't appear to be limited to just colon cancer - studies are showing that it has positive activity against other cancers as well. There weren't a lot of details included with this study, but as reported in the Journal of Natural Products on July 2, 2009, a group of scientists found that propolis was able to inhibit human pancreatic cancer cells under nutrient-deprived conditions. Of the dozens of bee propolis health benefits, this particular capability just may be the most exciting of all as pancreatic cancer has very low rates of survivorship. It is very difficult to treat and standard chemotherapy treatments are not effective in most cases. This study on the anti-viral effects of bee propolis was reported in the August 12, 2009 issue of Phytomedicine. Genital herpes caused by herpes simplex virus type 2 (HSV-2) is a sexually transmitted disease. The scientists aimed to determine if one of the main bee propolis health benefits is an ability to kill the HSN-2. What they found was that both a water based propolis extract and an alcohol based extract exhibited high levels of antiviral activity against HSV-2 in tests. They also found that infectivity was reduced by greater than 99% and anti-herpetic activity could be demonstrated for both extracts. The more concentrated the dose and the longer it was applied yielded greater anti-viral activity. The doctors also noted when they analyzed the propolis extracts, they found many different polyphenols, flavonoids and phenylcarboxylic acids. 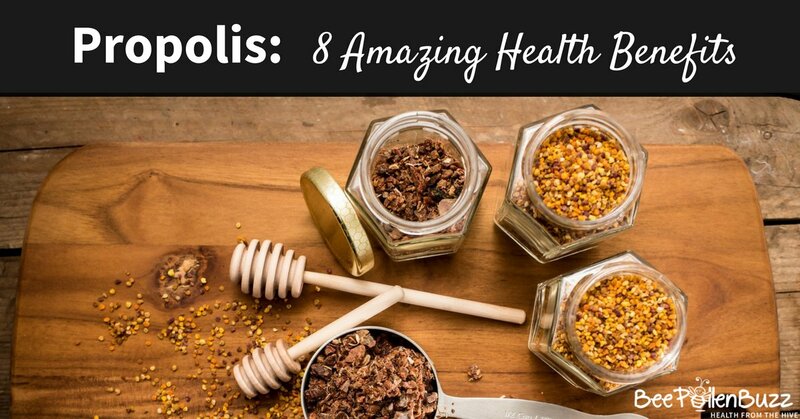 These are the powerful health promoting compounds that provide the many bee propolis health benefits. More and more people are becoming concerned about the negative health effects of long term cell phone use. I know I certainly am. A recent study on animals found that those exposed to electromagnetic frequencies suffered considerable damage to their cardiovascular systems. They found that the EMF's caused calcification of the cardiovascular system, which is the same process that occurs in heart disease. It is quite clear that EMFs are not healthy for us. Unfortunately, we can't escape them. Our cell phones, WIFI and wireless internet signals, TV's and even cordless phones all emit EMFs. So if we can't escape them, can we protect ourselves in any way from them? As it turns out, one of the many health benefits of bee propolis might be its ability to protect us from EMF radiation. This very interesting study examining if propolis can protect us was reported in Toxicology and Industrial Health, Vol. 25 in 2009. In the study, the scientists aimed to investigate the possible protective effects of a powerful compound found in propolis called caffeic acid phenethyl ester (CAPE) and the activities of antioxidant enzymes in the liver of rats exposed to a 900 MHz electromagnetic field (EMF). This would be similar to the EMF you are exposed to each day using your cell phone. What the scientists found was that in the rats that received the propolis extract, anti-oxidant levels remained elevated (this is very good as anti-oxidants protect us) whereas in the rats that did not receive the propolis, the EMF reduced the anti-oxidant levels. Ultimately, they concluded that the propolis extract CAPE may prevent the EMF-induced oxidative changes by strengthening the antioxidant defense system and increasing anti-oxidant activity. If you must use your cell phone daily for long periods of time, I highly recommend you take bee propolis several times throughout the day to help protect yourself from the radiation being emitted by your phone. One capsule of a 1000 mg propolis twice daily or 10 drops of tincture twice daily will boost your anti-oxidant levels significantly and help protect you from EMF radiation. As reported in the Journal of Ethnopharmacol in August, 2009, scientists decided to review the many studies done on propolis regarding its ability to promote oral care. Since propolis is already being used in some oral care products, the scientists felt that a critical analysis of all the studies done from 1978 to present date was warranted. Several investigations carried out with propolis and its many compounds showed reductions in Streptococcus mutans counts and interference with their ability to adhere to your teeth and glucosyltransferase activity, which are considered major properties in the establishment of the cavity process. Data from human studies have demonstrated reductions in Streptococcus mutans counts in saliva, the plaque index, and insoluble polysaccharide formation. These findings indicate that propolis and/or its compounds are promising cavity preventing agents. As reported in the Journal of Food Science in June/July 2009, rats were fed either a control diet or a propolis diet for 8 weeks to determine if one of its many benefits includes the ability to reduce body fat and cholesterol levels. What the scientists found was that the rats fed a propolis diet had lower adipose tissue levels than the rats fed the control diet. Furthermore, the propolis group showed significantly reduced levels of cholesterol and triglyceride compared to the control group. While more studies do need to be done, it is possible that the administration of propolis reduces the accumulation of body fat while improving lipid metabolism resulting in reduced cholesterol.